We are in Washington DC visiting with good friends Darla (My DIL’s Mom) and Dave. We would not normally go to our nation’s capital in the middle of a brutal winter, but Dave and Darla had tickets for all of us to see David Crosby in concert at Wolf Trap. The day we arrived it was announced that David Crosby had to cancel his concert due to illness. In spite of that, we are glad that we came. We always have fun in DC. Of course, I had to return to the American History Museum to see Julia Child’s Kitchen again. 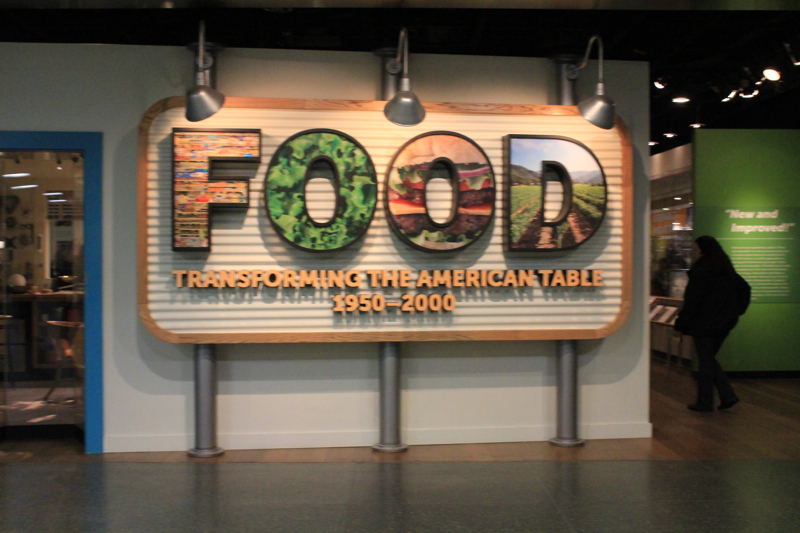 Her kitchen has been moved to a permanent exhibition of the history of food in America from 1950 through 2000. There have been great changes in our relationship to food over those 50 years. It explores the new technologies, the people behind the changes and how we relate to the food that we consume. 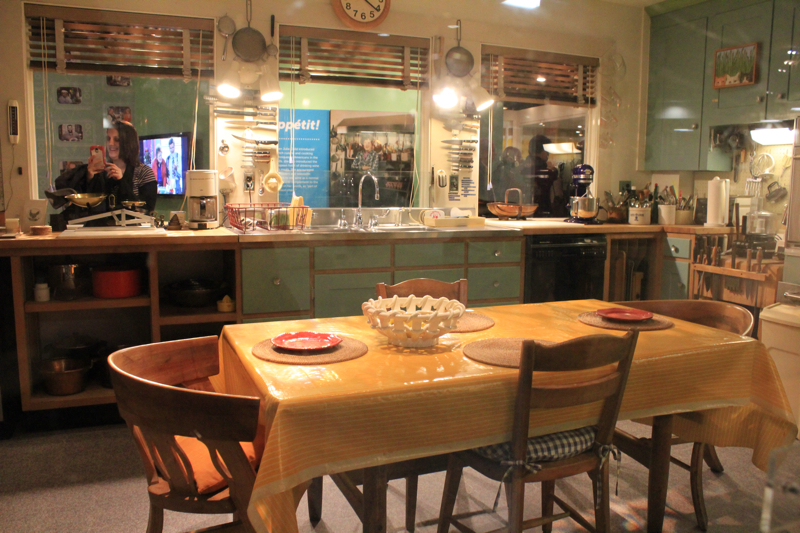 But the heart of the exhibit is still Julia Child’s kitchen. I love Julia Child. We also love the restaurants in Washington. Friday night we ate at Birch and Barley. It was recommended to us by Darla’s Son David (do you notice a pattern in names here? ), who was a chef in DC for a time. It is a brew pub with hundreds of beers on tap. But it is also known for its innovative food. 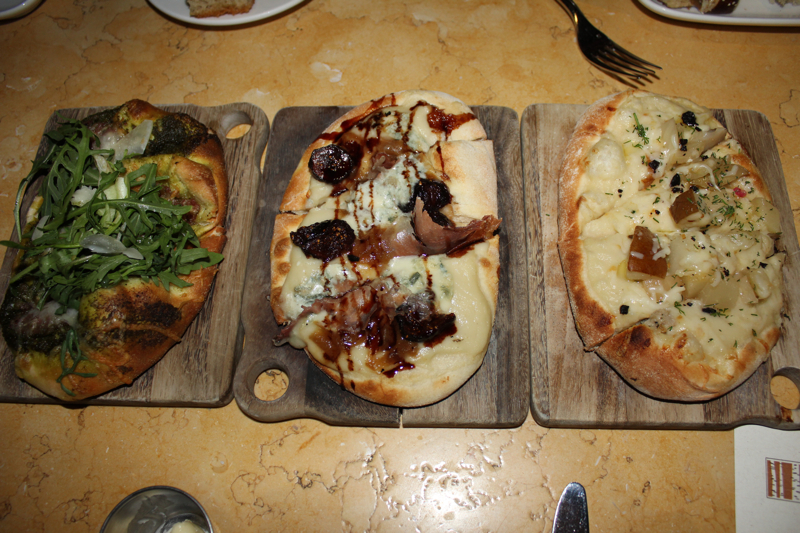 We sampled three of the flatbreads on the menu. From left to right, cotechino sausage flatbread with Asiago cheese, walnut pesto, preserved lemon and arugula, next is Fig and prosciutto flatbread with gorgonzola cremificato and caramelized onions, and last salt roasted pear flatbread with smoked aged provolone, confit of fennel, dill and onion puree. 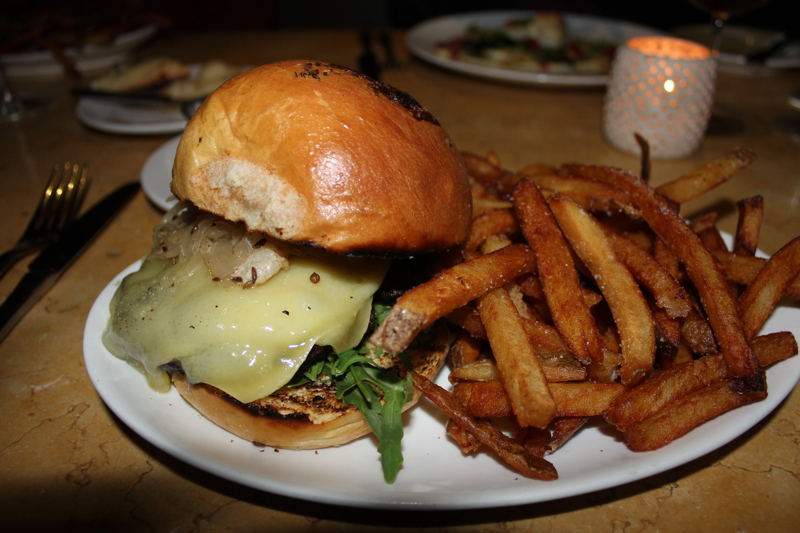 One of our entrees was a Brat Burger with beer-braised sauerkraut and emmenthaler cheese and hand cut fries and cornichon. Perfect with beer. 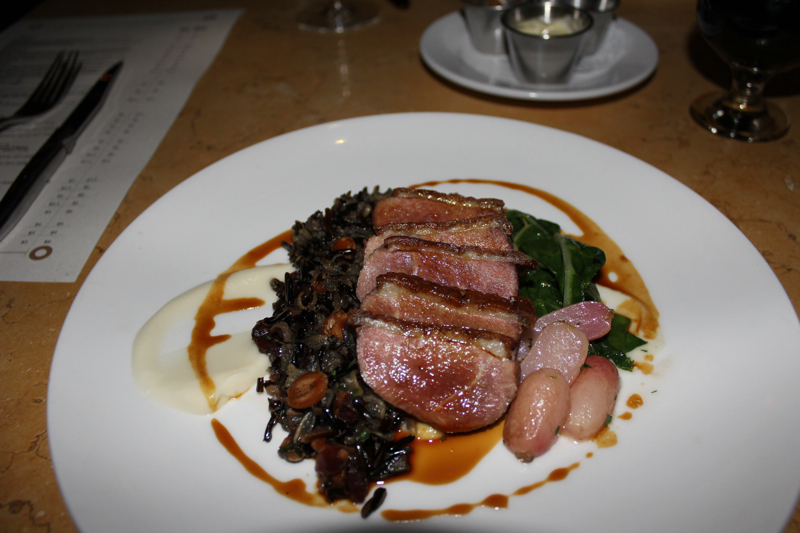 Another entree was Honey Glazed Duck Breast with leg confit, wild rice, brandied cherries, radishes and hazelnuts. 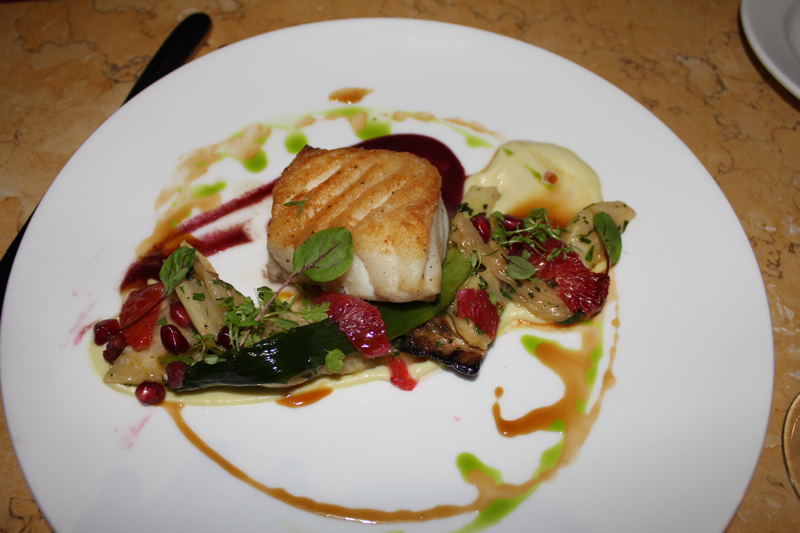 We also ordered the Pan-Seared Cod with roasted fennel, butter-braised celery root, pomegranate puree and blood orange segments. Today there is a chance of snow flurries. David and I are off to visit the National Gallery of Art. We have reservations tonight at a French restaurant called Bistrot du Coin. We are bundling up in warm clothes. Posted on February 8, 2014 at 9:30 am. Julia Child would have been 100 years old this month. In honor of the woman who made a nation “be brave in the kitchen”, I could not resist becoming a part of PBS’s tribute to her. #CookForJulia has asked us to cook one of her recipes for the celebration. I have made so many of her recipes from my collection of her cookbooks; everything from souffles to her signature boeuf bourguignon. So this time I decided to try something I had never made before. The Way to Cook was published in 1989, long after the success of Mastering the Art of French Cooking. It was a cookbook that saw a lot of use in my kitchen. The concept was simple. Learn to cook a master recipe and then you can easily tackle any of its variations. The potato section is a treasure trove of Julia’s favorite methods of cooking them. 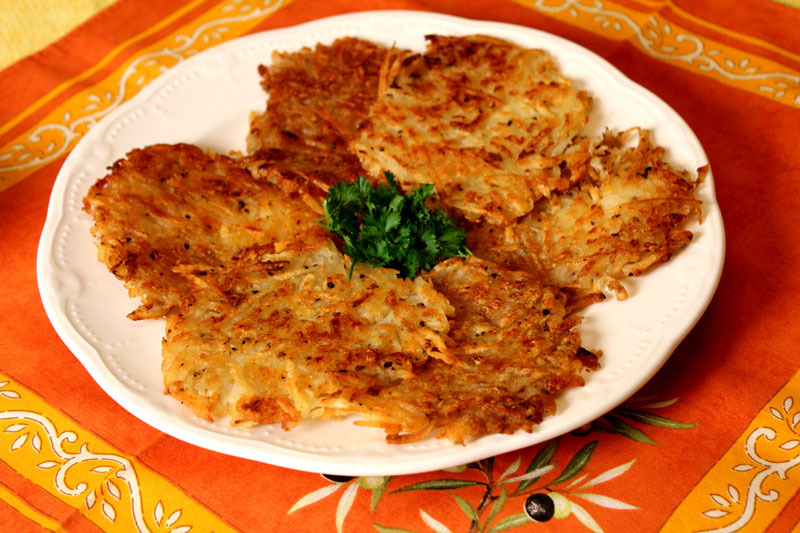 The grated potato galettes have an interesting background. Julia first had them at La Tulipe in New York City. She loved their crisp texture. When she asked how they were made, the restaurant’s sous- chef obliged with the details. The sous-chef was Sara Moulton. Two great cooks can’t be wrong. The key to these crispy, buttery potatoes is to steam them just until they are almost done. Under cooking the potatoes will allow the potato pieces to stick together without additional ingredients. Then you must refrigerate them until they are cold. This will make grating them easier. The underdone potatoes were perfect for grating. 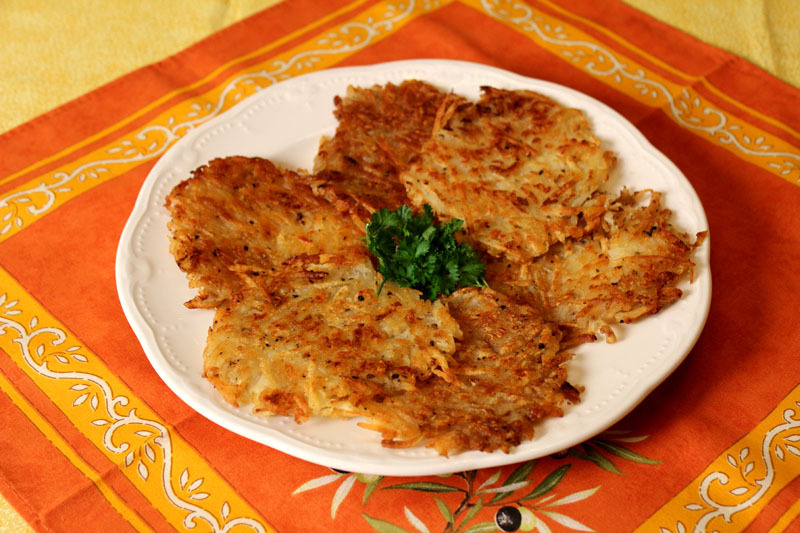 My favorite part of this recipe was the fact that the grated potatoes could be left in a bowl until I was ready to fry them. I love it when I can prepare dishes ahead of time up to a point. Because they are almost cooked, they will not turn brown. I chose to saute my potato galettes on my griddle, but Julia suggests cooking them in batches in a skillet. Next time I will do it that way because they would absorb more of the buttery goodness from the additional butter needed for each batch. Join me in cooking for Julia this month. These tasty potato galettes were worth it. 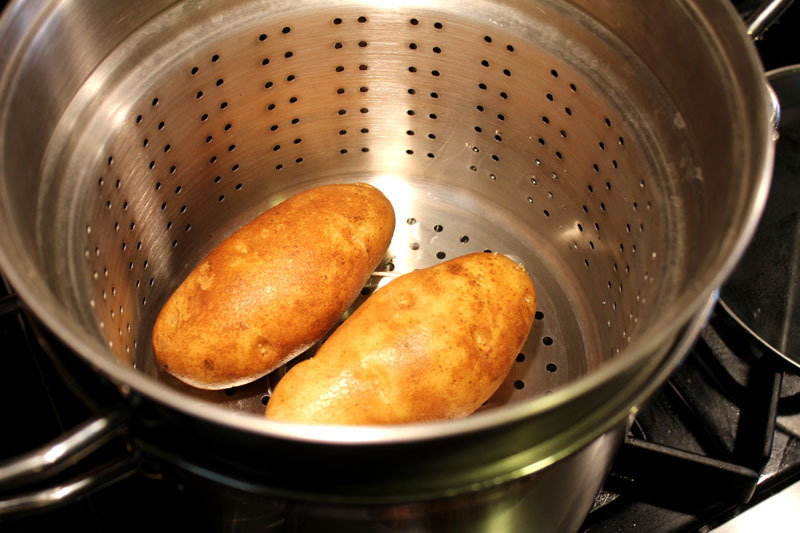 Scrub the potatoes under hot running water, then steam them for 12 to 15 minutes (mine took 25 minutes), until the potatoes are almost but not quite cooked. In other words, they should not be floury – after 12 minutes, pierce one with a sharp small knife, which should just penetrate. Cut one of the potatoes in half crosswise; if there is a raw central core, steam 2 or 3 minutes more. (If the central core is not cooked through it can discolor!) Let cool uncovered; the potatoes must be thoroughly cold before you grate them. 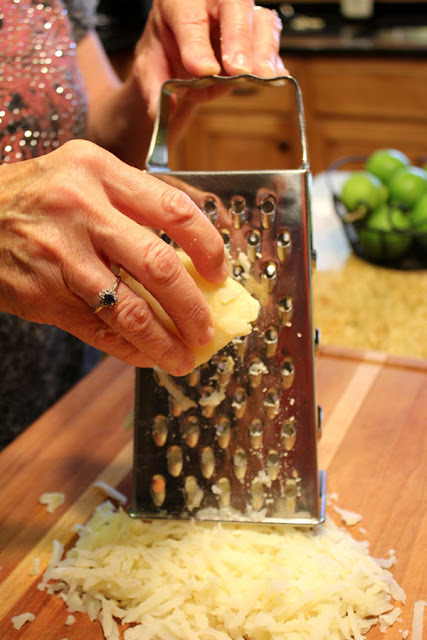 Peel the cold potatoes and rub through the large holes of the grater onto a baking sheet or tray. Toss lightly with a sprinkling of salt and pepper, leaving them loosely massed; set aside until you are ready to continue. 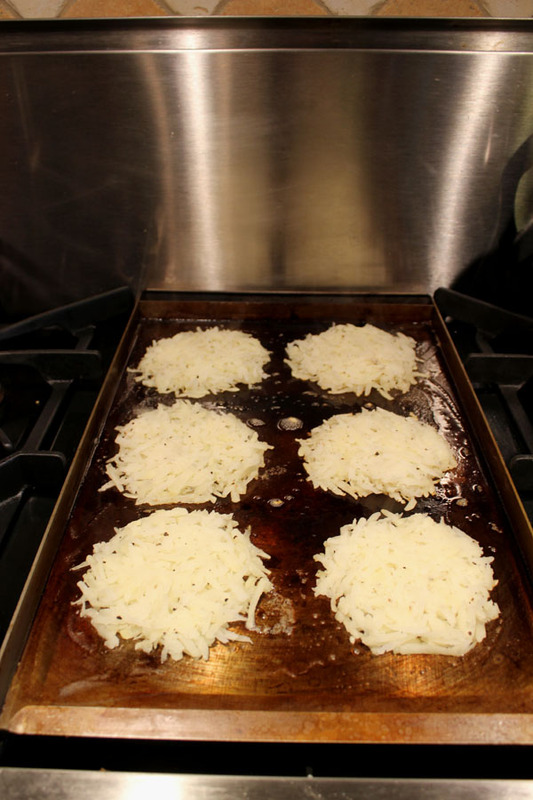 Film a frying pan with 1/8 inch of clarified butter or oil, and, when hot, spread in 1/2 to 2/3 cup of grated potato (the amount depends on how thick a galette you want). Saute over moderate heat for 4 to 5 minutes, pressing the the potatoes together lightly with a spatula, until the bottom has crusted and browned. Flip over, and saute to brown the other side a few minutes more. Transfer to a baking sheet, and keep warm while finishing the rest. Makes 6 to 8 galettes with 2 potatoes. The galettes may be sauteed somewhat ahead. Set aside uncovered, at room temperature. Reheat briefly in a 425 degree oven. Make a large galette in a 10 or 12 inch pan, and if you don’t have the courage to flip, brown the top under the broiler. 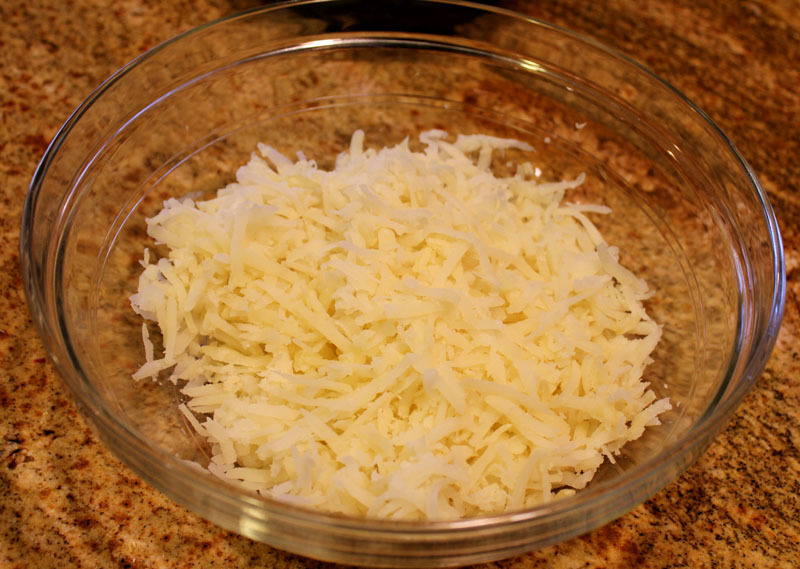 After a light browning on the top, you could then sprinkle it with grated Swiss cheese, and brown again. Posted on August 13, 2012 at 6:23 am. With the New Year, I have been wondering if my blog is still relevent. After two years of giving it my best with enthusiasm for all that I have cooked, I wonder if I have made a difference or inspired anyone. I hope so. 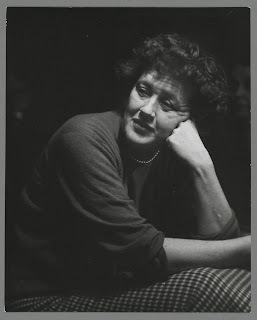 Even Julia Child wondered about the relevance of her fledgling cookbook and spent ten years trying to get it published. I am not comparing my humble missives to Mastering the Art of French Cooking, but we all know that when we put our words out there for others to read we are hoping that they will make a difference. As of January 7th, I will be celebrating two years of blogging. It has been such a worthwhile endeavor. I have met so many wonderful people, both personally and online. All of you are my friends. I visit all of you more often than I have been able to respond to your words. We have a wonderful community of bloggers! Communicating with each other keeps all of us inspired. Back in the day, people communicated by real mail. 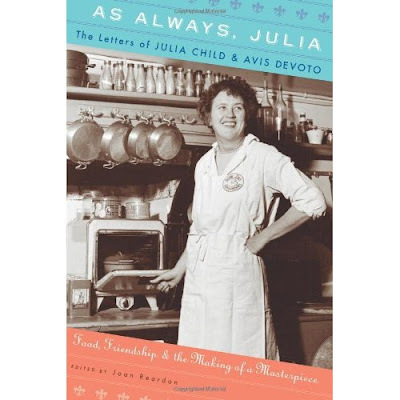 A new book has just been released with the letters between Julia Child and Avis Devoto. 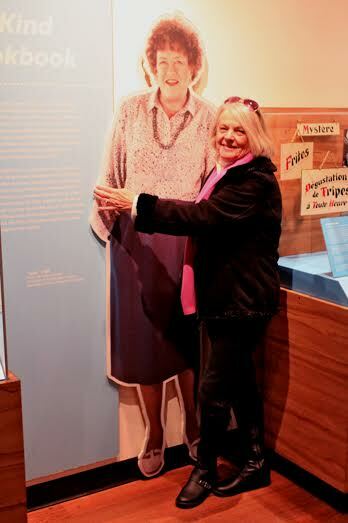 Julia and Avis were penpals for two years before they ever met. Avis became a support system and sounding board for Julia as she worked her way through the writing of Mastering the Art of French Cooking. She recognized early that Julia had a very special book in the making. We don’t have a book here, but I would liken their relationship to what we are doing here. We are supporting each other in our individual efforts to communicate our own stories. We talk to each other in our comments on each of our blogs. By supporting each other we keep the creative juices flowing. Thank you for your comments. I would like more. All of us would welcome that. So I am contemplating what changes I need to make in the future to make my blog more relevant. To thank you for your support I will send a copy of As Always, Julia to one lucky winner who makes a comment on this post. You have until Wednesday January 5th at 9:00 PM. International bloggers welcome. Posted on January 3, 2011 at 8:56 pm. I could have lingered here all day. 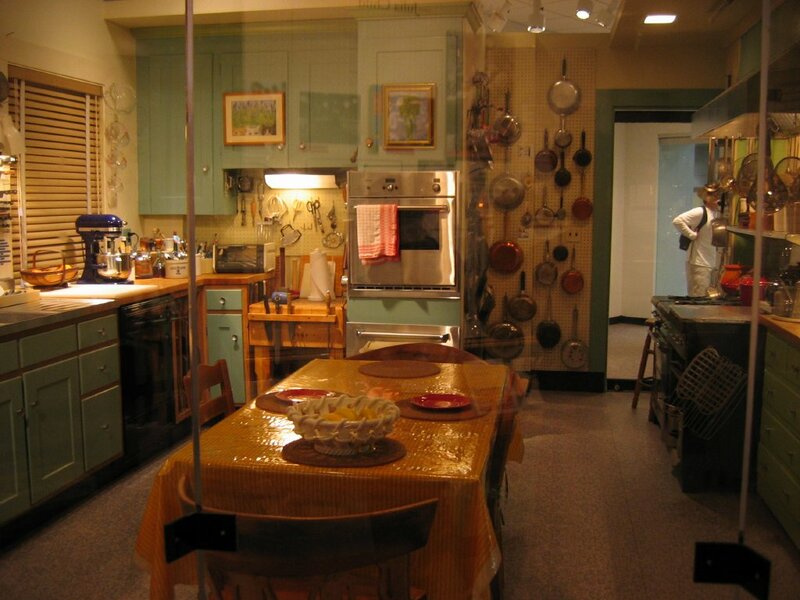 My pilgrimage to the Smithsonian American History Museum in Washington to see Julia Child’s Kitchen was one of the highlights of my trip. Gazing at the homey kitchen made me think of how much kitchens have changed over the last twenty years. Now we are all about granite and stainless steel. Julia’s kitchen is all about the woman herself. The aqua blue cabinets were raised two inches to 38″ tall by her husband Paul to accomodate her 6’2″ height. The dining table was purchased in Norway when Paul was stationed there after leaving France. Julia kept the table covered with a bright yellow oil cloth. The ceramic fruit bowl was purchased in Mousiers when they lived in France. Every pot in Julia’s kitchen had it’s place. Paul outlined each pot on the pegboards so that she would know exactly where to return them. I love her turquoise cannisters. Julia’s 6 burner Garland commercial range was purchased in 1956 for $429.00. Some of Julia’s later television shows were filmed in her kitchen. The table and chairs were removed and an island with a cooktop were installed for filming. But her wall ovens with the squeaky doors remained. Julia’s communication corner with phone and pad of paper is so typical of everyone’s kitchen. Notice her Mr. Coffee coffeepot. No stainless steel state of the art cappuccino machine here. 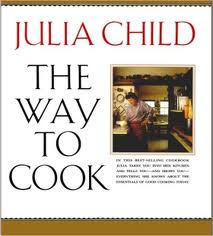 I wanted to hold Julia’s cookbooks and look for the pages with stains on them. Imagine owning her copy of Mastering the Art of French Cooking. 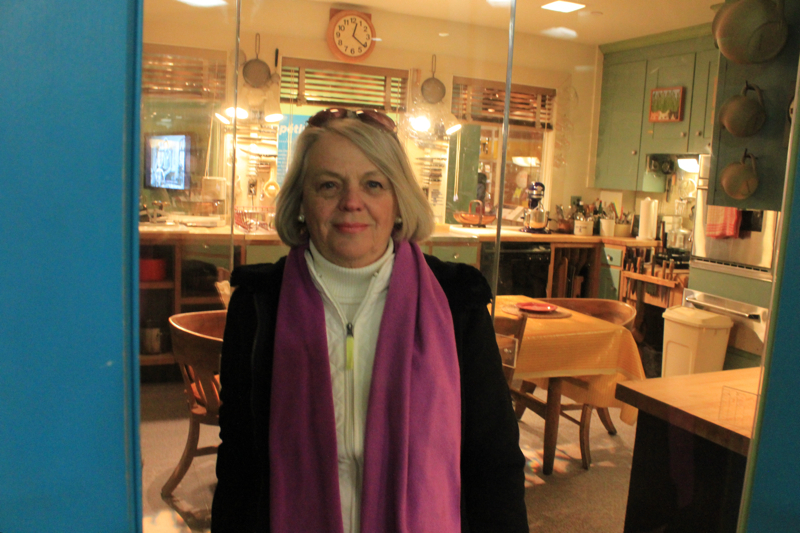 Other than the fact that this is a horrible picture of me, I was really happy to be this close to Julia Child’s kitchen. Kristen, Rachel and Michael on the Mall on Black Friday. I enjoyed this Mall better than a shopping mall. We are on Chincoteague Island right now. This is the view from our room. 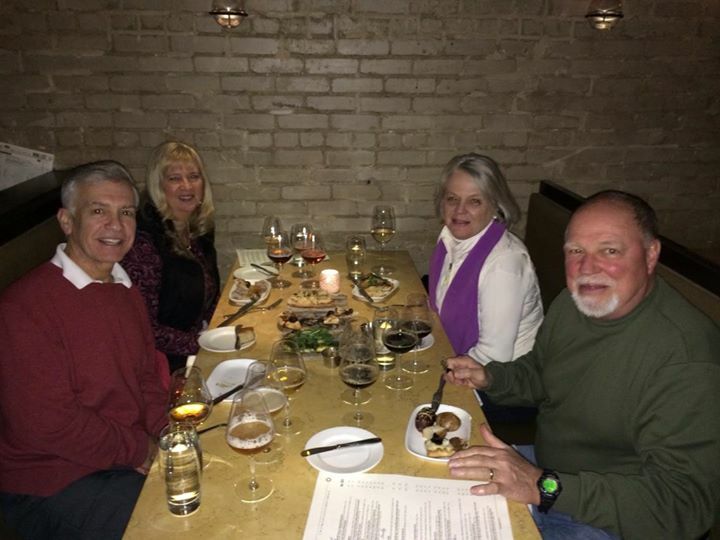 We are leaving for Ocracoke this morning and I will not have internet access for awhile but I am looking forward to telling you about the fabulous 7 course dinner that Kristen’s brother David served us at his restaurant, Urbana. It was one of the best meals I have ever eaten. Posted on November 28, 2010 at 9:28 am. Salads at Thanksgiving are sometimes overlooked. A tossed green salad seems like an afterthought when you are serving such hearty dishes as mashed potatoes, dressing, green bean casserole, and turkey and gravy. But this salad is a little different. It is substantial with ebony colored wild rice and is full of fruit like bright navel oranges, pale green grapes and dried red cranberries. The light dressing of olive oil, raspberry vinegar and orange juice adds just the right refreshing tang. But the main reason to love this salad is that it goes so well with the other components of the Thanksgiving table. Wild rice has always been associated with game, game hens and turkey. It is an earthy and usexpected addition to the usual line-up of dishes. The recipe is adapted from Ina Garten’s new cookbook, How Easy Is That? It is similar to one that I have been making for years. The main difference is the use of raspberry vinegar. It is worth using in this salad and you will have it to dress any salad in which you incorporate fruit. Bring the 3 cups of water, the salt, and the butter to a boil in a medium saucepan. Add the wild rice and stir to combine. Reduce the head to medium-low and simmer covered until the rice is tender (about 50 to 60 minutes). Drain off the excess water. Return the rice to the saucepan and cover. Let sit for about 10 minutes. Transfer the rice to a mixing bowl. Combine the dressing ingredients and pour over the rice. Mix well. Add the remainder of the ingredients and toss to combine. Transfer mixture to a serving dish and serve at room temperature. I have been enjoying cooking up all of these Thanksgiving dishes because we will not be home for Thanksgiving this year and I will not be cooking. We are going to the Washington DC area to spend time with family. I will be going on a pilgrimage while there. Since the last time I was in DC the Smithsonian has added a new exhibit that I want to see. I am going to see Julia Child’s kitchen. I am so excited. I promise not to sneak in a stick of butter, but I will report back with pictures of my own. Speaking of kitchens, I would still like more of you to participate in my Kitchen Reveal on December 1st. Just leave a comment on my previous post and let me know that you are interested in posting pictures of your kitchen on that date. Posted on November 20, 2010 at 8:11 am.